Home | Blog | Why Don’t We Stop at Arenys de Mar? Why Don’t We Stop at Arenys de Mar? Have you ever gone to a train station and took the first train to wherever it was going? My friend and I have. It was a Saturday morning when we came down to Placa Catalunya train station and hopped on a train that was going to a place called Blanes. We have never heard of it before. We decided that we would not ride till the terminal station but would randomly choose a stop to exit the train. It would have to be not earlier than 40 minutes. After riding for about 50 minutes I felt like that was our stop. It’s hard to say why. Most likely simply because it was where an old gentleman of my interest was getting off. I was observing him during the ride. He was wearing shorts which he styled with a warm hat that reminded me of one you would wear to Oktoberfest. He was reading his book and never stopped touching his beard. He seemed to know his way around, and I assumed he would live in a beautiful place. So we exited the train with him. We ended up at Arenys de Mar. 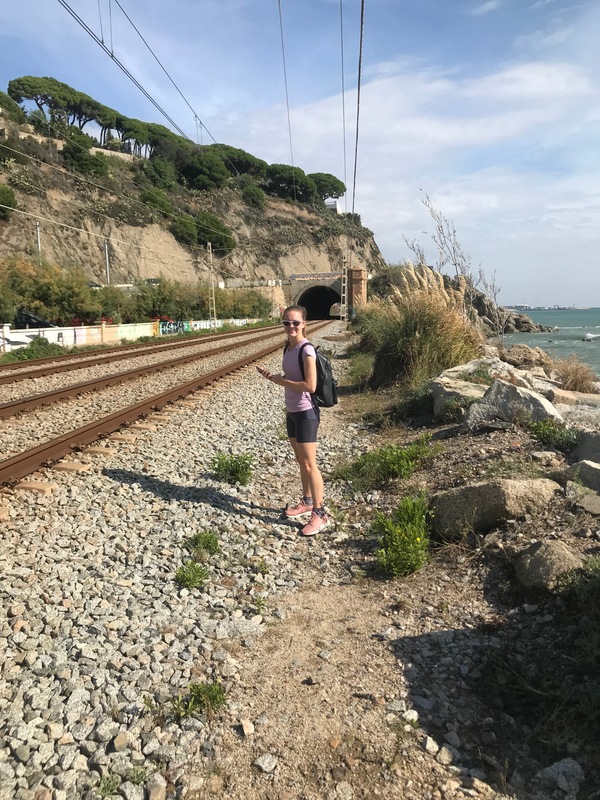 The railroad tracks were laid on the coast pretty much the whole way, so we were not surprised to find ourselves standing on a beautiful beach, facing the Mediterranean Sea. However, it was not the sea that astonished me. Magnificent cliffs were looming in front of me. Those could not be seen from a train window. But now they were here, diligently hurling the waves as if it was their job. There was no one around. The old man disappeared. Arenys de Mar seemed to be a traditional fishing town that was blessed with a beautiful beach. We did not see any fishing boats, but when I was looking at the golden sand I was imagining a group of happy old men returning from the sea with their catch. Everything was calm, in harmony. Massive stones went together with a profusion of light purple wildflowers thriving in the sandy soil. One more train passed by. I felt pure happiness from being outside. Have you ever experienced the feeling of driving past the wildland, looking outside your window and wishing you were walking there instead? I finally allowed myself to get out of that car and enjoy the scenery from the ground. I heard the noises, I smelled the fresh air. It smelled like freedom. I could have ended up anywhere, but a chance brought me to a beautiful Arenys de Mar. Let’s talk about money! We all need it to survive in this crazy cash-hungry world. However, as college students, most of us can’t seem to find enough cash in our pockets. This blog post is dedicated to all those frugal warriors that stretch their dollars. But really, do you even need a reason?